Stupa. A Stupa is a monument that houses the relics of enlighten beings. It is a structure that is able to shower the world and all sentient beings with great blessings. This stupa is crafted as a close replica of Shwe Dagon Temple of Myanmar which claim to be the only monastery in the world that house relics of all Four Buddhas of the present aeon. It is also recognized as one of the seven wonders of the world. Sima House. A Sima House is a designated sacred boundary where special religious ceremonies are conducted such as Sangha Ordination and Uposatha meeting of the Sangha. Currently, monks staying in BHS need to attend to these activities in other monasteries. With the construction of this facility they are empowered to have more of these spiritual activities. The above Stupa will be seated on top of this Sima House. Relics Center. We also intend to have this Sima House to double up as a relic center. The relics of the Buddha along with other enlighten beings, across all Buddhist Tradition, will be housed here.The relics may be viewed from either inside or outside the Sima House. Our intention is to allow the public to view the relics and offer their deepest devotion and reverence. Currently, relics are often exhibited only on special occasion. We believe this Hall of Immeasurable Merits is the only one of its kind in the world. This pioneering and most unique site will offer the devotees manifold blessings each time they offer their deepest reverence. This building will also abide by our BHS’s philosophy of 'Simple, Practical and Natural'. Though simple this building offer great practical value including maximizing land usage, and serve as a significant spiritual landmark for our merit accumulation and dharma cultivation. The Stupa, also known as Pagoda, we are intending to build will be a close replica of the Shwedagon Stupa of Myanmar. This is a really special stupa or pagoda. The Burmese community, which we are close with, first initiated this idea of building a stupa. BHS counter proposed by integrating a Sima and Relic Center. Hence, this project is a collaboration and BHS will build the Sima-Relic Center before the Burmese in Penang as well as Burmese artisans from Burma build the Stupa. 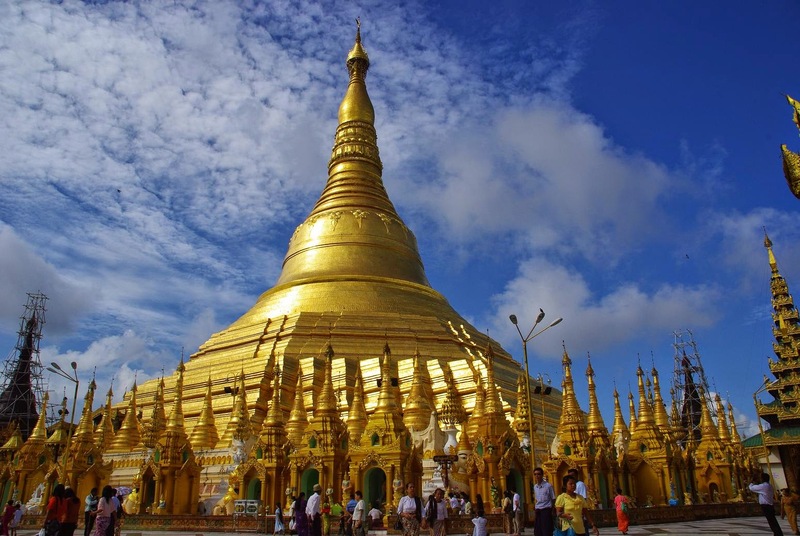 Wikipedia - The Shwedagon Pagoda officially named Shwedagon Zedi Daw and also known as the Great Dagon Pagoda and the Golden Pagoda, is a gilded stupa located in Yangon, Myanmar. The 99 metres (325 ft) tall pagoda is situated on Singuttara Hill, to the west of Kandawgyi Lake, and dominates the Yangon skyline. Historians and archaeologists maintain that the pagoda was built by the Mon people between the 6th and 10th centuries CE.. However, according to legend, the Shwedagon Pagoda was constructed more than 2,600 years ago, making it the oldest Buddhist stupa in the world. According to tradition, Taphussa and Bhallika — two merchant brothers from the city of Balkh in what is currently Afghanistan — met the Lord Gautama Buddha during his lifetime and received eight of the Buddha's hairs. “ There was a tumult among men and spirits ... rays emitted by the Hairs penetrated up to the heavens above and down to hell ... the blind beheld objects ... the deaf heard sounds ... the dumb spoke distinctly ... the earth quaked ... the winds of the ocean blew ... Mount Meru shook ... lightning flashed ... gems rained down until they were knee deep ... all trees of the Himalayas, though not in season, bore blossoms and fruit.